The religiously unaffiliated, or the “Nones,” are the fastest-growing religious group in the United States, now comprising about one-fifth (19%) of the adult population. Their growth is also evident at the ballot box, where unaffiliated voters now account for a significant slice of the electorate. The unaffiliated vote share in presidential elections more than doubled from 5% in 1980 to 12% in 2008. Currently, PRRI’s 2012 American Values Survey estimates that 16% of likely voters are religiously unaffiliated. An exploration of the unaffiliated vote since 1980s shows two interesting features: first, the Democratic advantage among this group is not a recent phenomenon but stretches back at least as far as 1984, and second, that unaffiliated voters display unusually robust support for third-party and independent candidates. In recent presidential elections, unaffiliated voters preferred the Democratic Party presidential candidates by a significant margin. 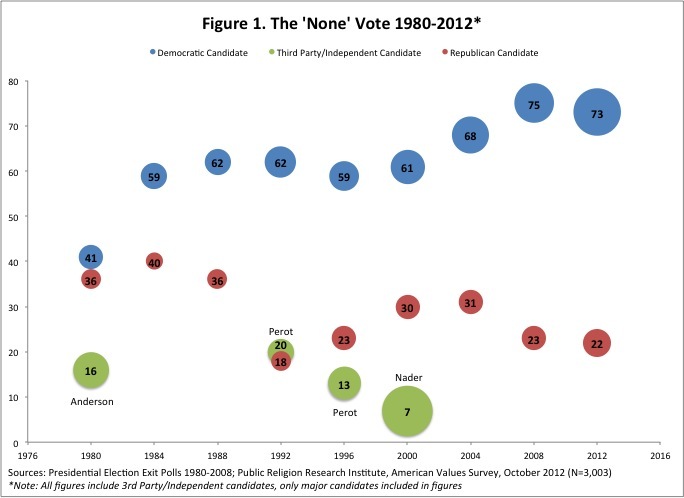 As Figure 1 shows, between 1984 and 2000, about 6-in-10 unaffiliated voters preferred the Democratic candidate. Since 2004, the Democratic advantage has increased among these voters has increased from roughly 30 points to about 50 points. Although Obama is currently underperforming his 2008 support among many religious groups, he is poised to match his vote margin among the unaffiliated. The lone exception to this general pattern is 1980 presidential election. In 1980, unaffiliated voters supported President Jimmy Carter over Governor Ronald Reagan by just six percentage points (41% vs. 35%), making this the only competitive race among unaffiliated voters. One reason for the closely divided vote was the significant support (16%) that independent candidate John Anderson, a moderate Republican congressman from Illinois, received. Another possible explanation might be that Carter’s status as a born-again Christian depressed his support among this group. Since 1980, unaffiliated voters have been strong supporters of Democratic presidential candidates. No Republican candidate has received more than one-third of the unaffiliated vote since 1988. As the unaffiliated have grown as a share of voters they have also become an increasingly important part of the religious coalition of Democratic candidates. In 2000, the unaffiliated accounted for 12% of Gore’s coalition. The American Values Survey shows that the unaffiliated are now the largest segment of Obama’s religious base at 23%. Although the increase in unaffiliated Americans seems to benefit Democratic presidential candidates, it also brings some complications. For the Democrats, one such challenge lies in reconciling the two largest religious groups in their coalition (black Protestants and the religiously unaffiliated) whose positions, particularly on social issues, are sometimes at odds. Unaffiliated Americans are also less likely to vote in presidential elections than other religious groups. Although they make up 19% of the adult population, the AVS found that only 16% of unaffiliated are likely voters. The future political impact of the religiously unaffiliated as a voting bloc now depends more on organization than on numbers. They tend to be younger and less politically engaged than religiously affiliated Americans, and importantly, more difficult to mobilize. The American Values Survey also has shown that there is a degree of diversity among the unaffiliated, which may also temper their influence. However, if these voters get organized they could fundamentally reshape the American political landscape. They are starting to already.